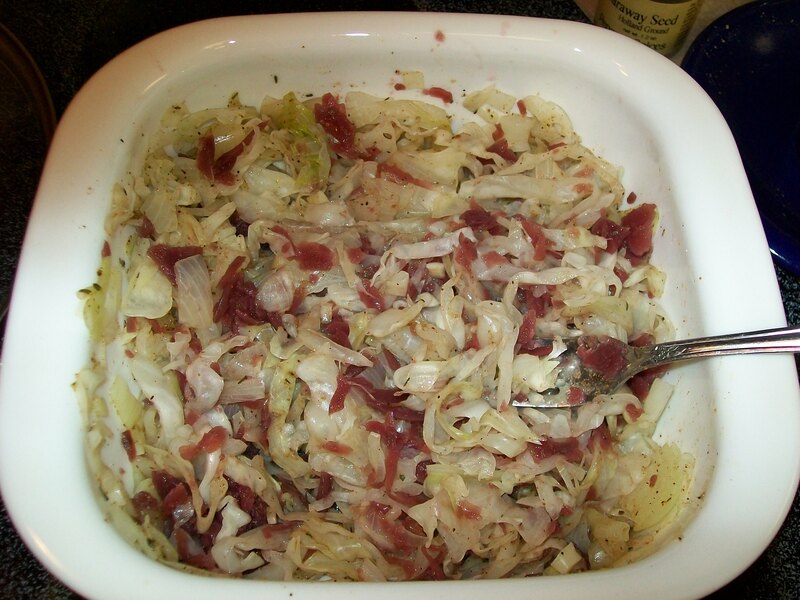 Cabbage and pork chops – two of the “good fortune” foods to eat on New Years Day. We did have our blackeye peas w/bacon, cornbread, ham and other fixins. Now lookin at a ham is boring so I’m sharing what I scrounged together earlier in the week but it still fits the holiday theme. The gentleman selling veggies on the former Beverly theater lot had lush heads of cabbage – perfect because they keep well in the refrigerator; just hack off a wedge when the scrounge mood strikes. I have various cuts of salvage grocery pork in the freezer so it has become the meat of choice lately. Did you know why people in the deep south ate more chicken and pork than beef? Before refrigeration was available, it was best to eat what you killed very soon. Small critters like chickens and hogs could be eaten in a day or two, before they could spoil. 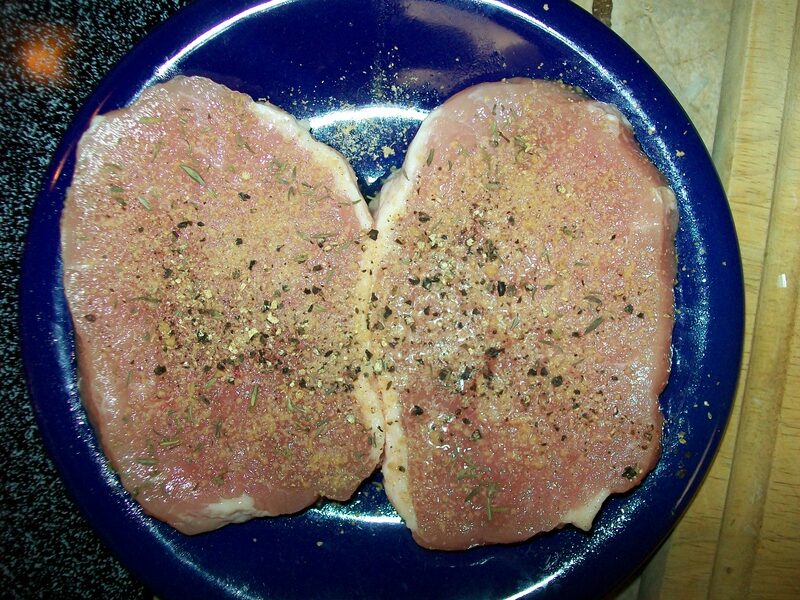 Sprinkle two pork chops (boneless loin here, but other types are OK) with black pepper and “pork chop seasoning” (I use Penzeys). 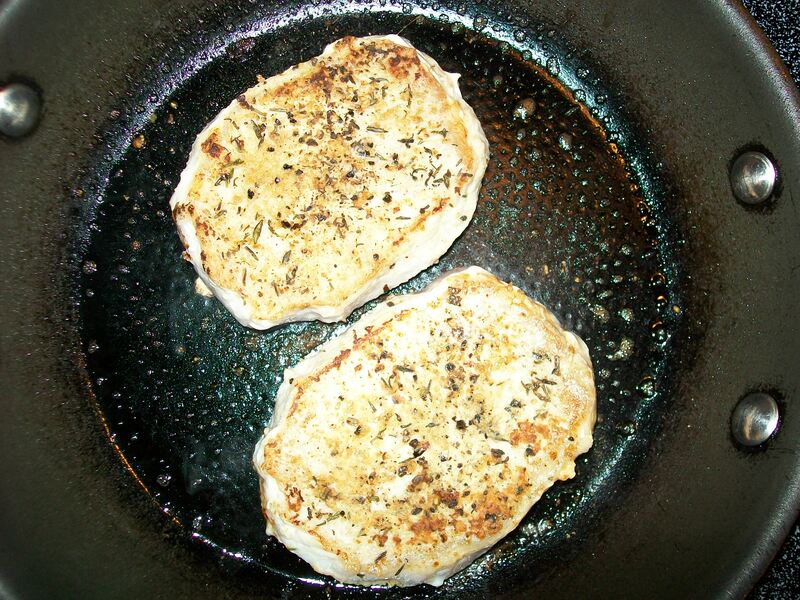 You can create your own with salt, garlic powder, white pepper, onion powder, and ground ginger. Yes, I know “seasoning” in culinaryspeak is salt and pepper but lets go with the common usage for sake of brevity. Heat a skillet to medium; spray with food release. Brown the chops for 2-3 minutes per side. Slice green cabbage into 1/2 inch ribbons and break up slightly. 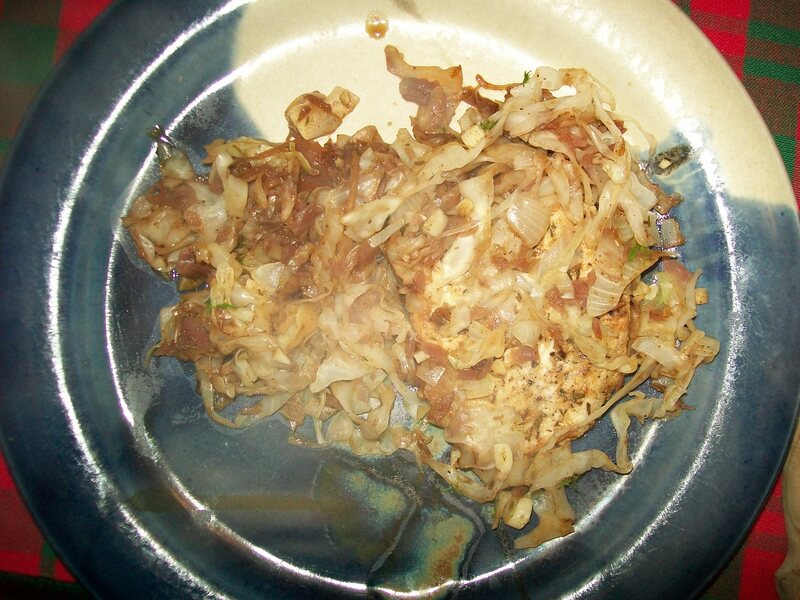 If you’re in a hurry, precook the cabbage in the microwave for 3 minutes before adding to the pan. Put the cabbage and 1/2 cup drained red cabbage (the sweet/sour kind) over the pork chops, mix together gently with a fork. Be sure to bury the chops! Turn the heat to low/simmer. Now take a cheap bottle of sherry and mix 1/2 cup with 1/2 tsp Kitchen Bouquet (my Mama’s anti-white cabbage trick). Pour it over the cabbage mixture. If you don’t have a cooking wine or don’t want it, substitute with chicken stock, water, or cider. Cover the pan and cook until the cabbage it tender, about 20 minutes. Serve with a green veggie for plate appeal. French bread or cornbread, pour some wine and you be done! My cornbread recipe will be in a future post. Toast the New Year! Actually two Mr. Mikes taking a ride on my rig. 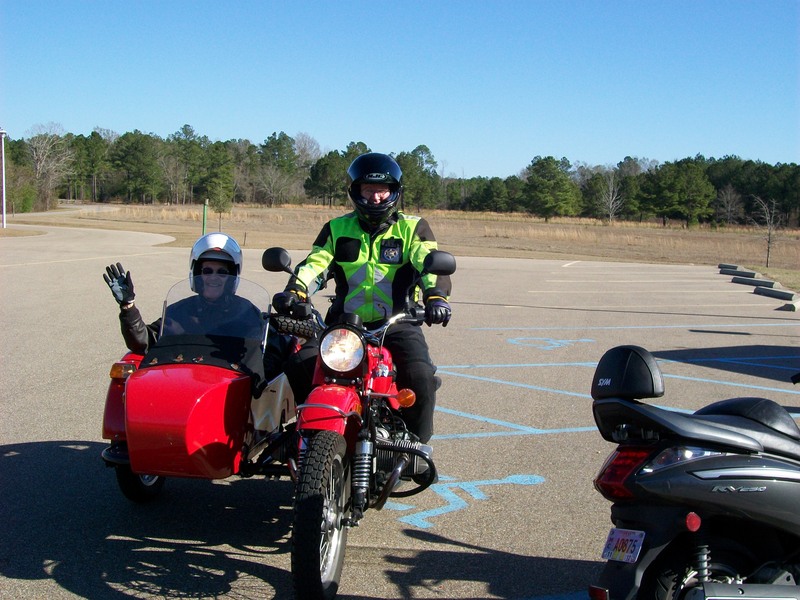 First ride of the New Year! Just wanted to post and say nice site, great to read from people with a clue. Thanks man! Keep on scrounging.